Fourways Gardens Guest Estate - Fourways Accommodation. Traditional hospitality. Set in a relaxed, peaceful 6-acre estate in Johannesburg's elite northern suburbs, minutes away from Fourways Mall, Monte Casino, Fourways Life Hospital, Major Highways and Business Centers, with a variety of restaurants to choose from in the immediate vicinity. Sandton City, Midrand and Rivonia are all within 15 minutes drive. Whether you are on a business trip or for leisure, require an overnight stopover, short holiday, longer stay, private function and excellent value for money, we are here for you. There is secure parking on the premises. The stylish, individually decorated accommodation has a colonial, Victorian feel. Guests may choose between - private, fully equipped one, two or three bed-roomed self-catering cottages, with fully equipped kitchens and TV with basic easy view Dstv. We also have fax, e-mail and laundry facilities - available on request. Cold breakfast is served daily, at an extra cost if required and should be booked in advance. Your English host, Jean is always on hand to ensure that your visit is not only enjoyable but that it be a memorable one. Fourways Gardens Guest Estate's intent is to be a provider of good accommodation and service, by providing the highest efficiency, most convenience and lowest cost for the customer. Basic Easy View DStv is available and can be upgraded to Premium Dstv at an extra cost. 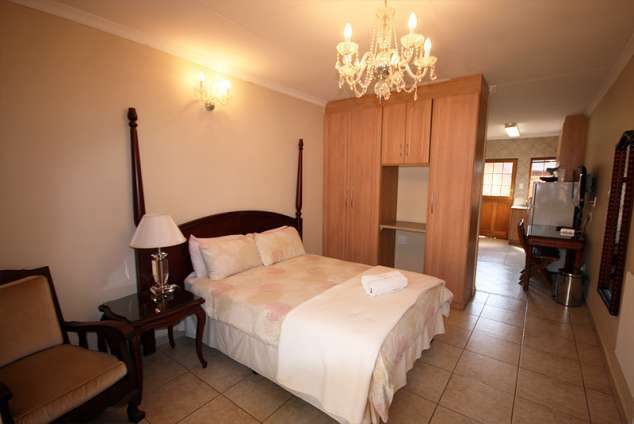 This is a three bedroom unit all with en-suite bathrooms (showers). There is a lounge and fully equipped kitchen serving two of the bedrooms. And the third bedroom has its own lounge, TV and fully equipped kitchen. All of our rooms are serviced daily (Not public holidays or weekends), we also offer laundry service. This unit has a private access and parking. This is a two bedroom unit, all with en-suite bathrooms (showers). This unit also has a lounge/dinning room and fully fitted kitchen with stove, microwave, fridge, pots and pans etc. The unit is serviced daily. (Not public holidays or weekends) We also offer a laundry service. This unit has a private access and parking. This is a two bedroom unit all with en-suite bathrooms (showers). This unit also has a lounge/dinning area, TV and a fully fitted kitchen with stove, micro wave, fridge, pots and pans etc. The unit is serviced daily. (Not public holidays or weekends). We also offer a laundry service. This unit has a private access and parking. This unit has one bed room with a double bed. This unit also has a lounge/dinning area, TV and bathroom with shower with a fully fitted kitchen with stove, micro wave, fridge, pots and pans etc. The unit is serviced daily. (Not public holidays or weekends). We also offer laundry service. This unit has a private access and parking. This unit has one bed room, with two single beds. This unit also has a lounge/dinning area, TV and bathroom with shower with a fully fitted kitchen with stove, micro wave, fridge, pots and pans etc. The unit is serviced daily. (Not public holidays or weekends). We also offer laundry service. This unit has a private access and parking. From the Airport: Take the R24 towards Johannesburg. Take the N1 towards Pretoria. Take the N3 towards Roodepoort. Take William Nicoal turn off. Turn right in a northerly direction. Pass Monte Casino on the right. Pass Fourways Shopping Complex. Pass McDonald's on the right. Next robot turn left into Uranium Road. At the BP Garage turn right into Bush Willow Road. Go straight over the round out and down the road until you get to a T-Junction. At the T-Junction turn right. We are number 27 on the left. 36569 page views since 18 Sep, 2006.